CLICK HERE to listen to show #3 of our Electronic Cottage radio show, which is a Frank Gingeleit special. 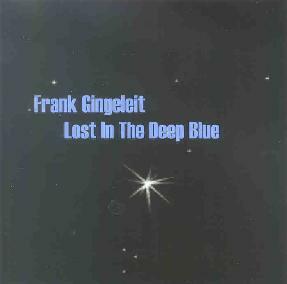 Frank Gingeleit - "Lost In The Deep Blue"
Frank Gingeleit didn't start recording music until he was in his 40's. And boy is he making up for lost time. Lost In The Deep Blue is Frank's fourth album in less than two years, and follows in the footsteps of his previous CD's, being completely unpredictable, and decidedly fresh and exciting with each new release. Frank's debut CD, Nightmares & Escapades, explored electronic music realms that incorporated avant-garde influences. Megalopolis remains the most accessible of his releases, with much to appeal to fans of the 1970's German Kosmiche school of electronics. And Toy Island narrowed the gap between pop and avant-garde music, while anchoring itself firmly in the land of strangeness and adventure. Like Nightmares & Escapades, Lost In The Deep Blue creates an electronic and atmospheric feel, even though the entire album was recorded using guitar synthesizer and electric guitar. But what sets the new album apart from its predecessors is the prominence of traditional instrument sounds and the sense that the music is being performed by a rock "band". And once again percussion is very much at the forefront of the music, and is all amazingly (to this non-musician) created by the guitar synthesizer. Tracks like "East Of India" and "Ride On A Tiger" feature an avant-psychedelic style, with wah'd jamming Bluesy guitar and various other guitar parts, prominent thudding percussion with a somewhat tribal feel, and a generally trippy vibe. The title track is one of my favorites, consisting of an interesting blend of jazz, rock and rough edged sonic aggression. Like King Crimson gone fusion, balancing equal doses of atmospherics and funk. I like the contrast between the busy, varied percussion and bashing soundscape chords. On "(The Process Of) Domestication", Frank produces a keyboard sound and rolling jazz style that reminds me of Rotcod Zzaj. "Love And Reality" is another highlight track, being an intense, atmospheric, rocking space-prog-jazz tune... it's hard to describe, but highly energetic, with a nice groove and residing deep in space. "Don't Know Where To Go? (I Don't Either)" is similarly spaced, and still heavily percussive, but more focused on the extended heavy rock soundscape chords and freaky alien embellishments. One track that is a bit different is "Some Kind Of A Cello Sonata In E Maj", which true to its title incorporates elements of classical music, and the cello reproduction does indeed stand out, though these parts are engulfed in the larger and much denser chord aggression that characterizes the album. And "All Suns Eclipsed" is a raw pounding rocker that closes the album on a spaced out, intense, garage rocking high. In summary, Lost In The Deep Blue is an impressive addition to what is quickly becoming a stylistically diverse and sonically compelling body of work. Wanting to investigate Frank's world in greater detail I conducted the following interview via cyberspace. AI: Reading your web page biography it seems you only started recording music in the past few years? Have you actually been a musician for many years? Were you ever in bands? Any other recordings other than the four solo albums? Frank Gingeleit (FG): In fact, I was beyond fourty when I started to make music in the serious meaning of the word. I knew some basic guitar chords taught to me by school mates as it was common for many kids of my generation. But I never really learned an instrument when I was younger. In my early mid twenties I was some kind of a manager of a local band in the city where I was studying. Sometimes during rehearsals or during sound checks I had the opportunity to play a bit of guitar or bass guitar when a band member wanted to hear how something would sound to the audience. For a while there was some kind of a running gag - when rehearsals became boring or showed no progress - to play The Clash’s "Police On My Back" with me on vocals... which was fun for everybody. But no, I never really was a member of a band. AI: So what inspired you to start recording now? FG: As I’m not a religious person I don’t want to use the word "awakening", but it was almost a situation like this when I had the idea to buy an electrical guitar I had been staring at for quite a while in the presentation window of a music store near the place where I was working at that time. As the realistic perspective seemed to be that I had bought another dust collector, I even chose the shape of the guitar in natural alder suiting the dining situation of our living room... But I was wrong. Only about two weeks later I started to record rhythm tracks on an ordinary cassette deck and played little solos to it. Somebody let me use his old four track recorder so that I had the opportunity to find out whether home recording would be something for me, and as he’s a drummer he also gave me a drum computer, and together with a bass guitar that I bought another couple of weeks later I founded my first "band". When we moved to another city some months later the mentioned person asked for his four track and the drum computer back. But as I was already an addict to music I immediately bought a used eight track, another drum computer and only a little later some more effect and recording tools and fit out the home office in our new appartment as a music studio. During a couple of weeks in the summer of 1999 I was recording my very first CD. I used the band alias Living Room, and the title of the CD was "Sketches In Blue", reflecting the fact that it contained eight Blues tunes composed by myself. To be honest, the result was very amateurish, and I made any mistake a beginner can make - it was rather a set of poor demos than a real CD. 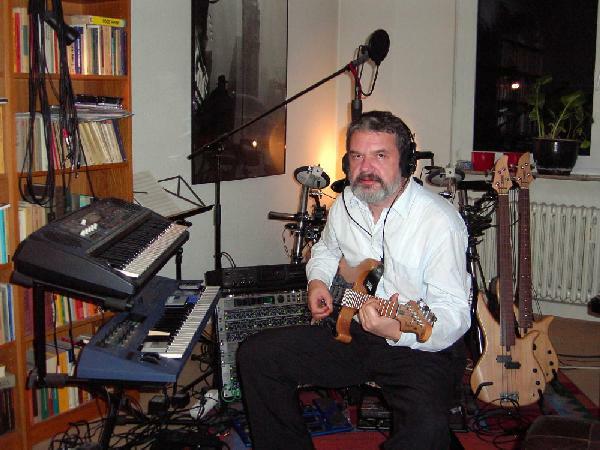 But this way I learned a lot about composing, recording, and - of course - about the importance of playing straight and in tune... And I kept on recording - three more CDs, again mostly Blues based but with elements of Rock, Funk, Ambient and even a little Jazz. AI: So how did Nightmares & Escapades come about? FG: In May 2002 I had just put together a selection of tunes for a new CD of this kind - personal demos to decide which bass line to change, where the vocals had to be sung again, in quite a few cases even to invent lyrics and vocal lines on recording tracks I had used for rehearsing guitar - when you sent me a copy of "Garl/Knot" by Chris Phinney and Hal McGee. It took me a day to decide to close the chapter "Frank playing Rock, Pop, Blues". The next day I started the recordings for "Nightmares & Escapades", and never returned to the previous material. That not anybody might get me wrong: I didn’t start to play in the style of Hal McGee and his musical mates, they didn’t even influence me musical wise. But it was their musical radicalism that broke down some border that still kept me caught in the area of rather conventional Rock and Pop songwriting, which, as I found out by this, was no longer "my cup of tea". I was at a state of art at that time where I either had to form a band or work with more sophisticated studio tools or studio musicians - with the perspective to produce some of this "almost-professional" stuff that is usually rejected by record companies. I had feedback from some professional musicians of the kind: you can sell your music if you use different drum sounds, if - alternatively - a real drummer would play the drums, if a female singer would do the vocals and the like. But this was not what I had in mind when I started to make music. So, to listen to Phinney/McGee's music was the right "cure" in the right moment... And I never had any regrets about having started something completely new with Nightmares & Escapades. AI: All of your albums are electronic in sound and feel. Yet Nightmares & Escapades was recorded exclusively with guitar, guitar synth and related effects, Megalopolis exclusively with synthesizers, and Toy Island recorded with a combination of the two. FG: I bought my first keyboard quite early im my "demo & rehearsal" period just to be able to add more sound colors to my music. But as I never learned to play the piano I was limited to a "paint by numbers" like use of it. This changed when I bought the guitar synth. Most guitarists that play a guitar synth use it to record midi notes and then let them play "automatically" with the help of sound samplers which provides lots of realistically sounding tunes that you usually can only play when you're able to use a keyboard as a piano player. I always used the guitar synth's audio output exclusively and tried to produce realistically sounding Fender Rhodes or Hammond organ or saxophone sounds which were the appropriate "colors" for my Rock, Blues, and Funk based early tunes. But, of course, I knew that my electronic instruments could perform a lot more sounds that really sound "electronic", and I used them for my rather experimental recordings. Nevertheless the "electronic feel" on Nightmares & Escapades is not produced with the help of synths. The apparent "natural" sounds such as drums and percussion and most of the technical noises are reproduced with the guitar synth. Most of what sounds like genuinely synth produced in fact was played with the guitar using modulation effects, feedback, reverb and delay. Megalopolis, in contrast, was exclusively produced with a so called virtual analogous synthesizer that provides a multitude of "vintage" sounds of the early sythesizer generations together with lots of modern "phat" sounds like those used in Techno and modern dance music, operated with an analogous play feel with lots of knobs and wheels and buttons. Here it was my goal to sound completely electronic - and nothing else. And of course to aquire a better understandig of this instrument. Making Megalopolis was as much a research in space and cosmic music as it was a research in synth technology as one reviewer put it. On Toy Island I wanted to blend the rather entertaining popular music that’s based on the artificial groove type "electronic" music with "serious" electronica and to impute musical content into a genre that's usually rather superficial. I produced this one with an arranger keyboard designed for dance music, the mentioned virtual analogous synth, and a bit of the guitar synth for some noises, the alienated "party gossip" in the background of the tune Hot Socks for example. Lost In The Deep Blue, my latest album, uses the same production set up as Nightmares & Escapades, but this time the intention was to let the program not sound electronic, rather to achieve a band sound. And again, what sounds most natural - the drums, bass guitar, sitar, cello, and the sounds that usually a keyboardist provides in a band setup - was played with the guitar synth, and what sounds rather weird or "electronic" was produced by using the guitar. And the guitar is used as such. You can hear it as a backing rhythm guitar at times and even soloing in a couple of tunes. This time my intention was to make the most "natural" use of electronic sounds and to blend it with the electro-acoustic sounds of an electrical guitar. AI: Each new Frank Gingeleit album is a surprise! You leaped from the somewhat avant-garde style of Nightmares & Escapaes to a more conventional, yet thorougly cosmic, electronic style on Megalopolis, and then surprised us again on Toy Island, incorporating elements of pop and dance. Tell me about how you transitioned styles from one album to the next. FG: With my music I have two general objectives. One is to acquire new forms of musical expression, and the other one is to express musical content regardless of the means of production. This opens a wide range of musical perspectives. And there is, maybe as a third objective, the demand that an album should sound coherent in itself. Putting all this together and assuming some kind of a personal musical and technical development, you might get an idea of the nature of the musical transitions that you mentioned. AI: I enjoyed Toy Island because in my opinion you did an excellent job in your stated intention of bridging the gap between avant-garde and modern popular music. It's accessible... yet so beautifully freaky. Nightmares & Escapades is similarly successful in it's blend of kosmiche music and avant-garde elements. FG: There are several ways to create musical excitement, for example strong melodies, an excellent instrumentation and - among many others - to blend musical styles that usually don't go together. With my music I try to investigate which unlikely musical marriages might work, to give an avant-garde flavor to spacy ambient music as in Nightmares & Escapades, to spice dance music with a freaky attitude as in Toy Island, or to give back an experimental edge to something that is regarded as a follow up of the Berlin School/Kosmische Music (Tangerine Dream/Klaus Schulze) by quite a few listeners as in Megalopolis. In Lost In The Deep Blue it's about using the same production setup used for an experimental and avant-garde electronic album for creating something that sounds like band performed improvised and spontaneously composed music. But it's never the technical aspect of blending styles alone. It's always also about the musical content. For me it's important that the musical topics are understandable, for instance to describe the situation of having reached a "highest point" and then not to know immediately what's next as in Everest! - And Then? from Nightmares & Escapades or to describe risky situations in general in a plausible way as in Ride On A Tiger from Lost In The Deep Blue. I was very pleased when I noticed that an internet radio station in Glasgow, Scotland had played Witchcraft Lesson At A Dwarves School from Toy Island in a Halloween show because of its "spooky" feel, and I was even more pleased when a person caught up in a separation and love conflict situation told me that Love And Reality from Lost In The Deep Blue expressed exactly what he felt. AI: Lost In The Deep Blue is the first album where we really recognize the guitar as an instrument. And the Bluesy style was new for your albums. FG: Although it's not obvious at the first glance, most of my music is Blues based - throughout all albums. Of course, it has not very much in common with the authentic Mississippi Delta or Chicago Blues, and I'm doing a lot to "disguise" the Blues roots of my music. But at times it's obvious when you know it - The Idustrialization Of Mars from Nightmares & Escapades in fact was conceived as a modern equivalent of a "Working Man's Blues" and it even has some kind of a turnaround like the classical twelve bar tunes. On Lost In The Deep Blue I wanted to make some aspects of my music more obvious. (The Process Of) Domestication says quite clearly "I am avant-garde", as says Some Kind Of A Cello Sonata in E Maj "I am neo-classical", and some tunes are overtly Blues based such as East Of India, Love And Reality, and Ride On A Tiger. On Don't Know Where To Go? (I Don't Either) that comes as much "electronic" as anything on Nightmares & Escapes I'm playing a bit with the listener - in the last few bars I switched off the effects from the guitar sound and kept playing what I was playing during the whole tune, and it turns out to be clearly recognizable Blues. AI: You have written a lot about German progressive rock bands from the 70's, many of whom have roots in the part of Germany where you live. Are these bands that you grew up with? Has progressive/kosmiche rock long been a part of your life? FG: To put in the right biographical order: My parents moved to Mannheim in South Western Germany when I was two years old, and I grew up there. After I finished High School I lost the contact to this town and returned there for job reasons about twenty years later, almost exactly five years ago. There were four progressive Rock bands from Mannheim in the Seventies of the last century that are still internationally known and considered as belonging to the core of the so called "Krautrock", namely Nine Days' Wonder, Kin Ping Meh, Tritonus and Twenty Sixty Six And Then. For me personally there is a special relationship with the music of the early Nine Days' Wonder. The backyards of the houses where I lived when I was a child and where the members of Nine Days' Wonder lived and had their rehearsal room were almost vis-à-vis. There was a time when I as a child had already to be in bed when the young adults of Nine Days’ Wonder had rehearsal time... So, you can say that their music was a part of my musical "mother milk". 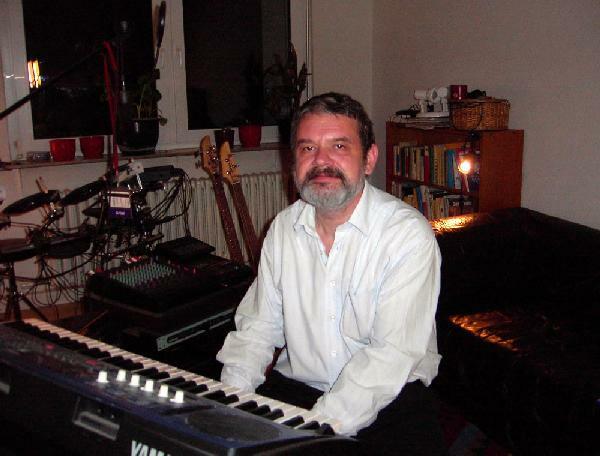 Mohn und Gedächtnis ("Poppy And Memory"), the band of Peter Seiler before he founded Tritonus, were one of the first bands that I ever saw playing live. Mad Fashion, the predecessors of Twenty Sixty Six And Then, frequently played on school fests when I was in the eight or nineth grade. There are still - and in some cases new - relationships with some of the musicians of the bands mentioned. Just a couple of days ago I met Walter Seyffer of Nine Days' Wonder on our market place, Peter Seiler is the owner of the studio where my CDs are mastered, Günter Klingel, drummer with the band Message in the Seventies who also lives in Mannheim, was my drum teacher for a while, just to mention a few examples. AI: Did their music have a strong influence on you? FG: I'd rather say no in the sense that my music might be considered as a follow up of theirs, what it is definitely not. Especially, I was not influenced by the so called Berlin style or "Kosmische Music" as I simply didn’t know most of it when I started to record my "trilogy" from Nightmares & Escapades to Toy Island. I listened to Manuel Göttsching’s Inventions For Electric Guitar for the first time after you talked about Ash Ra Tempel as a possible reference for Nightmares & Escapades in your review, and I didn’t know anything about the mid period Tangerine Dream releases like Ricochet, Rubycon or Stratosfear at the time when I recorded Megalopolis with which my tunes on this album are frequently compared. I think that Planets’ Spring Dance, where almost every listener said "Berlin style", owes more to Beethoven’s Sixth Symphony (Pastorale) than to any of the mentioned Tangerine Dream releases. But, on the other hand, my music does owe a lot to the Seventies music with respect to its general attitude. It’s my goal to carry on the spirit of openmindedness and experimentalism of the Seventies of the last century into this "new millenium". AI: So who would you say were your influences? FG: Who really influenced me - though again you won’t hear it immediately if you compare their records with mine - were John Cage and Maurizio Kagel. If their music - and their general "Fluxus" concept - wouldn’t exist, I would never have dared to start something like a "musical carreer" at the age of 45, my age when I recorded Nightmares & Escapades. It was their concept of anti-music or at least of an anti-academic approach toward music that encouraged me to develop my own style and not to worry about whether "real" musicians would accept my musical output. Cage has even brought tunes on stage where you hear nothing. Instead of outnoting his tunes Kagel had little drawings in the printed versions of his works that should be interpreted by the musicians according to what they see and feel. There was not only the "prepared piano" for which Cage is famous, but he and his friends of the "Fluxus" group also used prepared (and unprepared) objects of everyday life - such as saws, jars, bottles - for their music and the musicians on stage were completely free in their way of using these "instruments". What I’m doing is to transpose this concept to real instruments, including sequenced patterns provided by a synthesizer, guitar chords or even Blues phrases. If you’re looking for any intellectual background of my music, you’ll find it here. AI: Reading the various articles you have submitted to Aural Innovations, it seems that Germany still to some degree embraces, or at least has not forgotten, it's pioneering role in progressive rock history. It was a pleasant surprise to read about the Ladenburg show, where not only did these great 70's bands perform, but it was made a community event. Then of course there's the Finkenbach festival. FG: According to my experiences the so called Krautrock is much more estimated and played outside Germany. I don’t see so many German contributors to the Krautrock webring, Krautrock fests in the UK usually don’t feature any bands from Germany, the musicians of the genuine German progressive Rock bands of the Seventies that I know personally today receive royalties for their music of that time rather from abroad, and so on. The Ladenburg show - with Kin Ping Meh, Nine Days’ Wonder, Twenty Sixty Six And Then and Tritonus - was a singular event with no follow up planned so far, this year’s Finkenbach program included only two shows in the tradition of the classical German progressive Rock - Guru Guru and an appearance of Damo Suzuki with Tiere der Nacht and members of his Network. The most Krautrock I hear these days comes from your Aural Innovations radio shows, believe me! I just recieved a taped show from an independent radio station in Spain where - besides tunes of Neu!, mine and others - they also played some contemporary Krautrock by a band called Akazia - they’re from the US. My contemporary favorites of this genre as they don’t just preserve it but give it further development are ST 37 from Austin, Texas, Skye Klad from St. Paul, Minnesota, or Ousia, also from the St. Paul area, with their phantastic Cluster follow up Face The Robot... I think that the estimation of progressive Rock from Germany rather declines over here. In the general press it simply doesn’t show up, and only very scarcely even in the music press. Regarding the internet, we have - basically - two kinds of websites/web magazines here concerning the so called "German Rock". One kind has a strict fan attitude, completely uncritical and with a rather lexical or even taxonomic approach toward music and history, and the other kind is rather hack critical concerning contemporary progressive music from Germany - but you can bet on seeing the 132nd review of "Selling England By The Pound" going online on one of these pages pretty soon... I fear that the way progressive music from Germany is dealt with in Germany these days is rather a part of the problem than a part of the solution. When Can recieved an Echo, the German equivalent of the Grammy or the Brit Awards, for their lifetime work in February, not even the presenters seemed to know what this was about, and it was John Frusciante of the Red Hot Chili Peppers who told the audience of the international importance of this band. And, by the way, not even Karheinz Stockhausen, besides Heinz Werner Henze internationally regarded as Germany’s most important contemporary composer, currently has a record contract. AI: We're very pleased to have you as a contributor to Aural Innovations, and you write for other music publications as well. But you are also a journalist by profession. Tell me about the kind writing you do for a living. FG: Journalism has many facets, writing articles is just one of them. My current job is mainly the proliferation of articles written by others and to adapt them for specific publications and the needs of the editors of these publications. I’m my company’s contact person for the media in the area where I live - journalists call me and ask me for confirmations or denials of their investigations or make little interviews with me on specific topics related to my company. Or I call them and offer topics or articles. Besides this I’m the organizer of public events, public lectures or authors’ readings, and I’m doing some kind of relations management concerning any aspects of my company’s business related to the public. So, my job in the field of journalism is rather being a PR journalist and company’s spokesman. For more information you can visit the Frank Gingeleit web site at: http://www.frankgingeleit.de.